A new guide book by the leading travel media company Lonely Planet has been released to commemorate the National Park Service’scentennial. USA’s National Parks is an ambitious book, covering all 59 of the designated national parks as well as special features such as presidential memorials, other protected spots like national seashores, monuments, and recreational area. With such a lengthy itinerary, the book hits the highlights of each park such as size, entrance fees, and the types of people that the park would appeal to. It provides an overview of top experiences and scenic destinations that visitors should not miss. General information about where to stay and eat, best hiking trails and drives, of-the-path secrets, and nearby attractions are also packed into this handy 5 x 7.5 inch book. Hundreds of full color photos, many full-page, help readers visualize landscapes and available activities in each location. A pull-out map pinpoints location of each park, so you can see if several are close enough to visit in one vacation. Plan the perfect destination using the book’s information regarding best parks for hiking, wildlife watching, amazing adventures, families, scenery, and winter time. Check out the list of top 10 experiences and tips on the best times to visit. A section that includes history, conservation, wildlife, and geology provides need-to-know background that allows visitors to more fully appreciate America’s national parks. 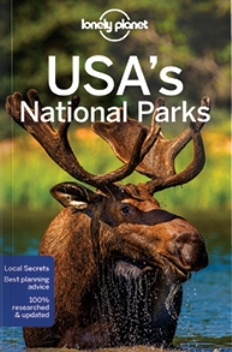 In addition to the general guidebook, Lonely Planet has published five updated guidebooks that include 11 of the most popular national parks in North America. 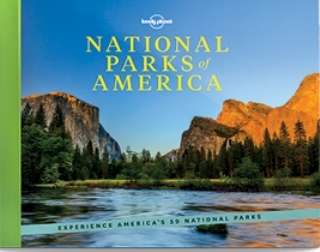 Comprehensive coverage and practical information for exploring each park (such as clothing and equipment for hiking, best drives, and cycling tours) are also included in these full-color, detailed editions. If you love beautiful coffee table books, Lonely Planet recently released a hardback version called Lonely Planet’s National Parks of America: Experience America’s 59 National Parks. This edition is a breathtaking, illustrated tour through every park in the U.S. and its territories, from Acadia to Zion. Stunning panoramic photography leads the reader through recommended itineraries. In addition to inspiring photos, it includes background, practical information, facts, and advice for exploring each park.